Hello dear players! Our event madness is almost over! 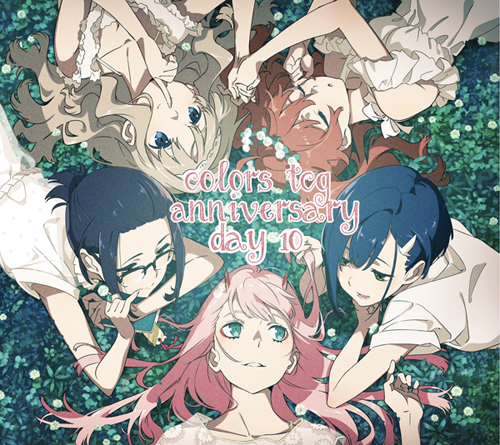 Thank you for participating in our Anniversary, I hope you've had fun! After all that super hard work, it's time to relax! Here is the bonus day I promised at the beginning of the month. You may comment here and claim one of the 20 Great Eight cards, in case you missed one. If you got all of them, you can always grab one for a player who didn't and trade it to them. You don't need to wait for my reply to log the card you take. Also, for some additional fun, let's take a look at the results of Day 7! See how many crayons did you win. Since all 20 days (and the bonus day) of our Anniversary events have been posted, you may soon be able to master our amazing Great Eight deck! A - instant mastery of any character deck! That means all 20 cards and the mastery badge, but without the mastery rewards for it. Please make sure that you physically received all 20 cards before you submit your mastery (no pending cards). This event, like all Anniversary games, will close on July 1st CLOSED!, noon GMT! 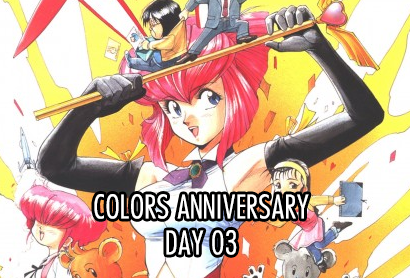 It's almost the end of Colors Anniversary! We've all done a lot so let's talk about our Colors plans and accomplishments today. Are you collecting a mass deck of your favorite series or maybe one based on character type or seiyuu? Or maybe you have all our favorite pairings neatly arranged into double decks? Mastered all incarnations of your favorite character? Not doing anything of that sort yet but would like to? Share it with us! For doing so you can take greateight20 and any number of choice character cards that add up to 20. This means you can take as few as one card numbered 20 or as many as 20 cards numbered 01. No need to wait for my reply, you can just log your rewards! Good evening! We're finally starting to wind down the anniversary event. It's a shame, but all good things must come to an end. All my posts have been discussions so far |D; so tonight I figured why not play a game? Let's play word association! - I'll start us off with a word in the post itself. - A commentator (#1) will reply with what word they associate with the word in my post. - Then the next person will make a new reply saying what word they associate with the word in #1. - And on from there! - Please wait until at least two people have replied before you reply next. You can play this game up to five times. Every time you play you will be rewarded with three random cards (for a fifteen card total if you do all 5 times!). And on the first play you'll be rewarded with greateight19 as well. This game ends July 1, noon GMT, like all the others. (unexpected right lol.) Have fun! Hello Colors! We are nearing the end of our anniversary event, hope everyone has been enjoying it so far! While the anniversary event is wrapping up, the FIFA World Cup is just getting started. I don't know about you, but I'm very excited for the tournament... So for today's event, we are playing some soccer/football! 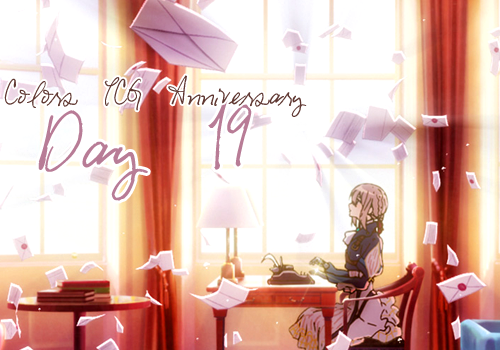 We are almost done with this year's anniversary, but the year itself is only half over! We still have another 6 months left (which doesnt seem like a lot either.) However, that also means we have been through 6 months of the year already! So for todays question, what have you done differently this year so far? Any new animes you got into? What about new things in your life? And if not yet, anything that is coming up in the second half of the year your looking forward to? How about any of those E3 games? Anything is fair game in here! For participating, you can grab 2 choice cards featuring a 1 and an 8, and of course greateight17. Like all Anniversary games, this post is open till July 1st! Well we only have a few days left in the Anniversary.. and here I am, bringing back some more creative games. Sasuke fellow with bright pink clothing(yesyoudo)? Do you want Sailor moon to have polka dot hair? Or do you just want to seriously color something properly... Go for It! Just have some fun and spend time just coloring! If you need some sites, I just google '___ coloring pages' like anime, sailor moon, ect. Like I said, this is a game I hosted before: Here are some from last round. For participating, you can grab 2 Choice cards from different decks and greateight16! Rolling right along with the games! Oh, that's a good idea! What's your dream series? Is it a 100 hour game or a 100 episode anime or a 100 chapter long manga? What kind of genre is it and what kind of tropes does it have in it? Do you have an idea who would write it, draw it, or compose the music for it? I'd love to hear what you'd want if you got to make something just for you! For completing this day, you can receive 2 random cards and 2 random crayons and immediately take greateight15. You know the deal by now: this round ends July 1st noon GMT. Today is Copy/Paste day... As in Here I am, on this glorious 14th day of the TCG 8th Anniversary, using a game as old as time..FAKE DECK MAKING! Colors is a TCG related to asian origin media, and a lot of series and topics can't be used on colors (like western shows, couples, fanart, celebrities, ect.) But wouldn't you like to make one for yourself? Well, this is the Ideal time to do just that! Just make a fake deck with a topic of your choice and share it with everyone here on colors! We have a template for Character decks and Special decks. Take a look at the past versions of this event, lots of past versions, and last years... to see some of the decks everyone thought up! For making a deck or commenting about some you would like, you can take a choice character card, choice special card, and greateight14! Hi everyone! For today I'll be recycling Veth's idea from two years ago - let's talk about anime/manga/video game crushes! Tell us about your first waifus and husbandos and how dedicated you were to them? Do you still love them? Is another character your one true waifu or husbando right now? Or maybe you have multiple waifus and husbandos? Do they have something in common? Or you have no fictional crushes at all? Either way share your stories to get greateight13 and one choice special card that you can claim right away as well ad five random cards! Like all anniversary posts, this game will close on July 1st at noon GMT! Hello Colors! Hope everyone is enjoying the anniversary event! For today's event, get ready to bust out your amazing MS Paint skills, we're drawing choice cards! The rules are simple: draw up to two choice cards! (yes, two!) The choice cards can be from either character or special decks - the only rule is that the choice cards must come from different decks. The drawing can be as elaborate or as simple as you want, and the quality doesn't matter at all. Have fun with it! Feel free to draw it using MS Paint/Photoshop or whatever program your heart desires. 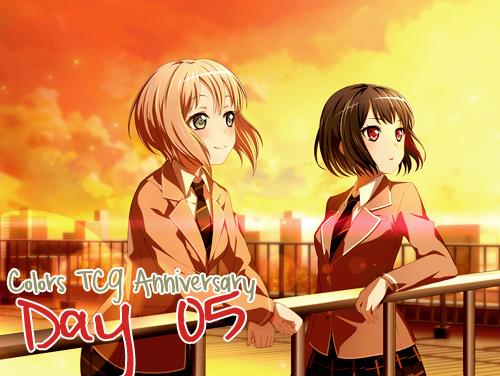 Have a look at the game from the 5th anniversary here for inspiration! For submitting your drawings, you'll receive the choice cards that you have drawn, greateight11, and 4 random cards! No need to wait for me for the choice cards, feel free to log them after you've posted your comment! We're already halfway through the Anniversary events. Don't worry though, there's plenty more fun stuff to come! Today's discussion revolves around Colors decks... The ones out of our reach, that is. Is there any series you wish you could get a Colors deck out of? I don't mean things you wish someone would donate, but things that are undonatable by our standards. Maybe it's a book that doesn't have an anime adaptation, or a piece of Western media with no eastern connections, or an Aesthetic that is hard to capture in deck form. Anything goes. For completing this day's event you can take 2 choice cards, one warm colored (red, orange, yellow, brown) and one cool colored (green, blue, purple, gray). You will also receive greateight10! Like everyone else's games, this round ends July 1st noon GMT. Hello again, come inside! That's what she said ahahahahaha! Oh man this one will be awful. The task today is to make a funny/unfunny/cringeworthy meme from any of your fandoms. Any type of visual meme will do, captions, advice animals, apyrs, loss, even freakin political chart memes... It can be as bad and as simple as you want. For doing this monstrosity, you can take 2 choice cards of different characters from the same series (not neccessarily the one you just memed). And obviously, you're getting greateight09 as well! This event will close like all the other ones, on noon GMT, July 1st CLOSED!. Happy Friday! We're already on day 8 of the anniversary event! This weekend I'll be visiting my childhood home for the last time ever (my parents sold the house ;;) so we're going to do some reminiscing for today's event. Let's talk about how you got into anime! What was your first anime? (or manga?) Was there a series that got you hooked on the medium? Did you see pretty pictures on the internet and decided that you must watch whatever this is right now? (because that's what happened to me) Any other fun tidbits about your introduction to anime/manga? For sharing your thoughts, you will be rewarded greateight08, four random cards and a choice card! The choice card must come from a series that is at least ten years old. No need to wait for me for the choice card, just comment with what you're taking! As with all the Anniversary games, this game ends July 1st, noon GMT! Hello dear players! I hope you're enjoying our Anniversary events so far! Here's a one that I've been doing for the last few years, hope you're gonna like it! Please join us for our Colors Family Feud-style special! Please link me your reward thread, otherwise I won't be able to give you your prizes before closing the game. NOTE: This event will technically close before the other ones, on noon GMT, June 21st CLOSED! However, you will still be able to answer the questions and get the Great Eight card, as in all other Anniversary events, till noon GMT, July 1st CLOSED!. The only difference is that after 21st you won't be able to win crayons, because your answers won't count towards the point totals. Once again bringing back the bingo event! Check previous years for examples? First, go here to create a bingo card out of your fandoms/series you are collecting decks from. Take a look at last year's post for examples. Post it in a comment! Second, take a look at people's bingo cards and mark all the fandoms you share. Comment their bingos with your answers and possibly bond with people you didn't know you shared a fandom with? For sharing your bingo card you will receive greateight06 which you can take immediately and 4 random special cards. In addition to that, after Anniversary closes, you'll get one random card for every bingo you reply to, no matter how many fandoms you match! For every bingo you get on someone's card, you'll get an additional crayon. This is to encourage people to reply! I'll also ask you to compile links to all bingo cards you replied to and all bingos you got on people's cards, to make passing out rewards easier - thanks! This game, like all anniversary games, will close on July 1, noon GMT! For responding today, you'll receive 3 random cards and greateight05. And as with all anniversary games, this round ends July 1st noon GMT. Have you ever wanted people to tell you their favorite books, or movies, or television shows, but all they give you is a list of names or titles, and you have no idea if you'll like them? First, go to Crunchyroll or Random Anime. You can also use any other site that has a "random result" button. If you'd rather read manga instead, any site that allows you to randomly choose a series will do (the one that starts with a B for example). Pick a series at random. You may repeat this step if you get something you already know or something that obviously isn't your thing. If it's an anime, watch the first epsode (or at least 5-10 minutes of it). If it's a manga, read the first chapter. Then post your impressions and if you'd like to continue watching/reading in at least 2-3 sentences. For sharing your thoughts you'll get greateight03, one choice character card and one choice special which you can take immediately. You'll also receive five random cards. This game (and all other anniversary games) close July 1st, noon GMT! Hey everyone! 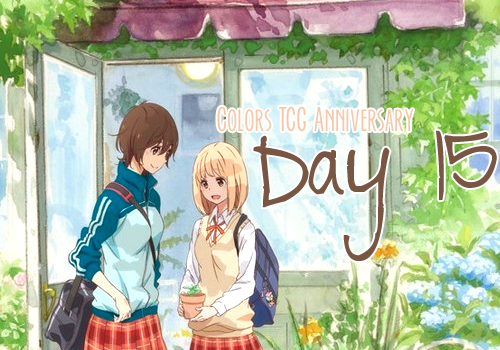 Welcome to the 2nd day of the Colors Anniversary! 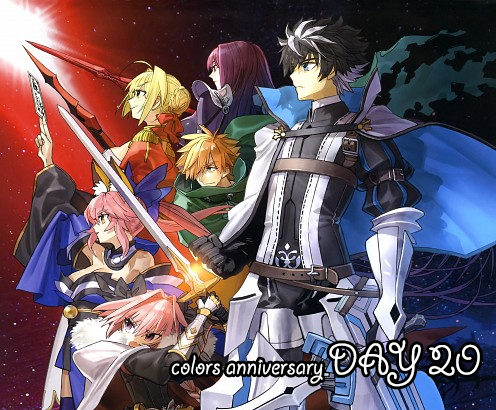 Today's activity is going to show your fellow Colors TCG Players how strong your party is! Whats that? You don't know what I mean by 'party'? Why, your RPG Battle Party of course!! You don't have one? Well, now is the time to Make one!! Your reward for participating in this is 3 Choice character cards! They have to be the 3 colors you picked for your border (If you use Pink, take that as a red or purple) and of course greateight02 as well! No need to wait for me to give you the cards, feel free to log them once you post your team!